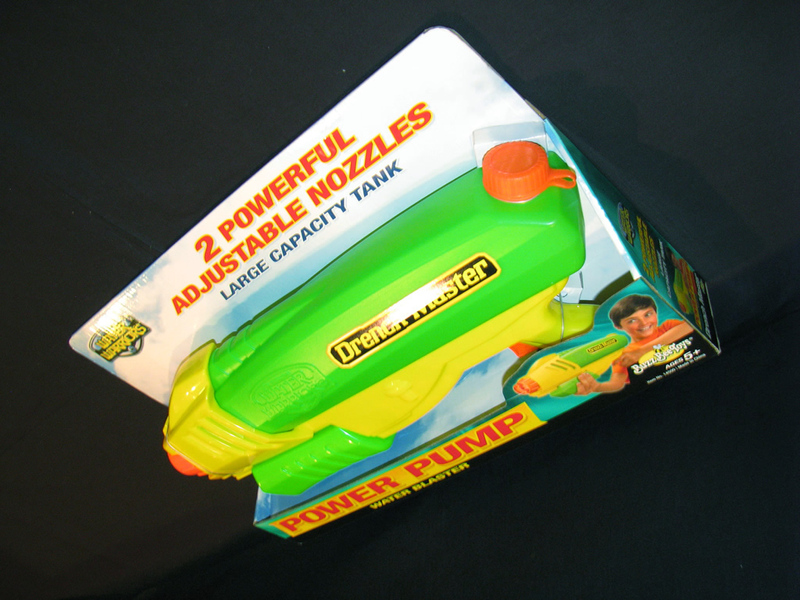 The Water Warriors Drench Master is a simple, effective pump-action water blaster released by Buzz Bee Toys Inc. in 2015. Following in the footsteps of older Water Warriors pump-action models, the Drench Master brings to the table greater capacity than the 2008 Water Warriors Avenger while still offering a nozzle selector, albeit with only two nozzle settings from which to choose. For this type of water blaster, the Drench Master offers good capacity and performance in a solid package. Like most of the other new Water Warriors brand water blaster packaging, most of the Drench Master lies in full view except for its rear grip region. That part is obscured by the “hero” image which also serves to give the packaging a little more strength. 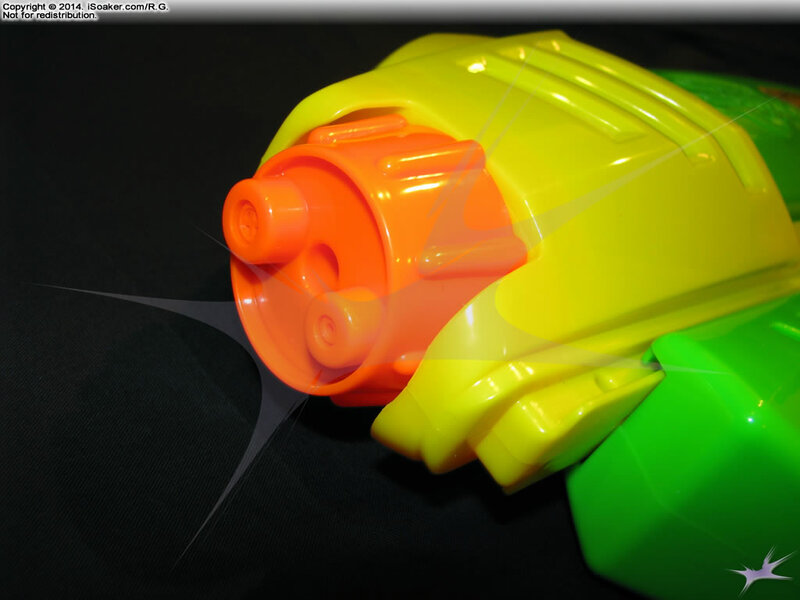 Readily visible are the Drench Master’s nozzle selector, pump, and reservoir which does indeed extend into the yellow area towards the front of the blaster, indicating this water blaster offers good capacity for its size. From another angle, the “trigger”-grip region and reservoir cap come more clearly into view. Though the trigger, itself, is purely ornamental, the management at Buzz Bee Toys feels that it serves to make the blaster look better. The reservoir cap, while better than a basic snap-cap, is made of a softer plastic and does not feel as sturdy as the harder-plastic reservoir caps found on larger, pressurized water blasters. Of course, despite the fact that more of the Drench Master is visible at different angles, one needs to free the blaster from its packaging to get a true understanding of how it feels and performs. Behold, the Drench Master in its full glory! 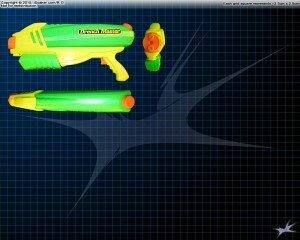 Ok, it is a small-to-mid-sized pump action water blaster with a fake trigger. 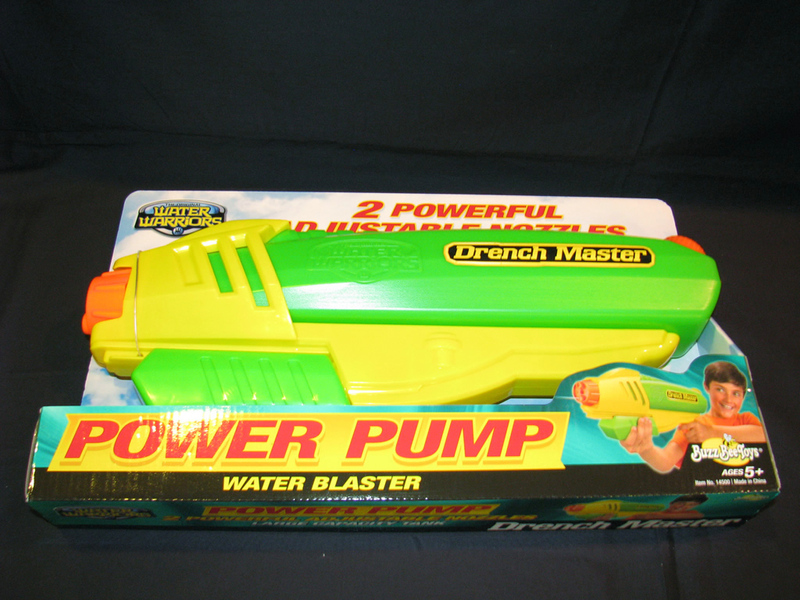 However, unlike the Water Warriors Steady Blast, the Drench Master has more detailing and texturing on all both its grips (pump and rear/”trigger”) as well assome angular detailing on its sides, front, and top. The finger indents on the rear grip region are somewhat more closely spaced than optimal, but others may find his quite comfortable depending on one’s hand size. The Drench Master features two nozzles: one stream setting and one burst setting (four, mostly parallel, though semi spreading streams). Both nozzles are, of course, directly powered by this blaster’s pump, meaning that performance is somewhat dependent on how hard one pulls on the pump. Both the stream and burst setting perform well with the burst setting pushing out slightly more water per second than the stream. The burst setting as well gives slightly better area coverage upon impact, but since it is made up of smaller streams, it is also more likely to be affected by cross-breezes. The Drench Master pump smoothly and pushes a decent amount of water per full stroke. While unable to produce a continuous stream, the Drench Master’s ease of operation makes it a good choice for those newer to water warfare. The reservoir does a good job of making the most of the space available given the Drench Master’s overall dimensions. Being a pump-action water blaster, as water is drawn from the reservoir for each pump, air replaces the removed water via a small hole in the reservoir cap. Unfortunately, being a lower-price point water blaster, the cap is basic and offers no valve system. The hole in the cap is really simply a hole and water can escape out of it if the Drench Master is held at steeper angles or laid on its side/back. In general use, the cap functions well, but is definitely not as secure as caps found on larger, pricier water blaster. 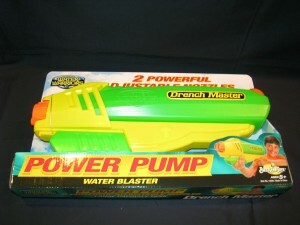 In the end, the Water Warriors Drench Master is a good example of a solid, straight-to-the-point pump-action water blaster. 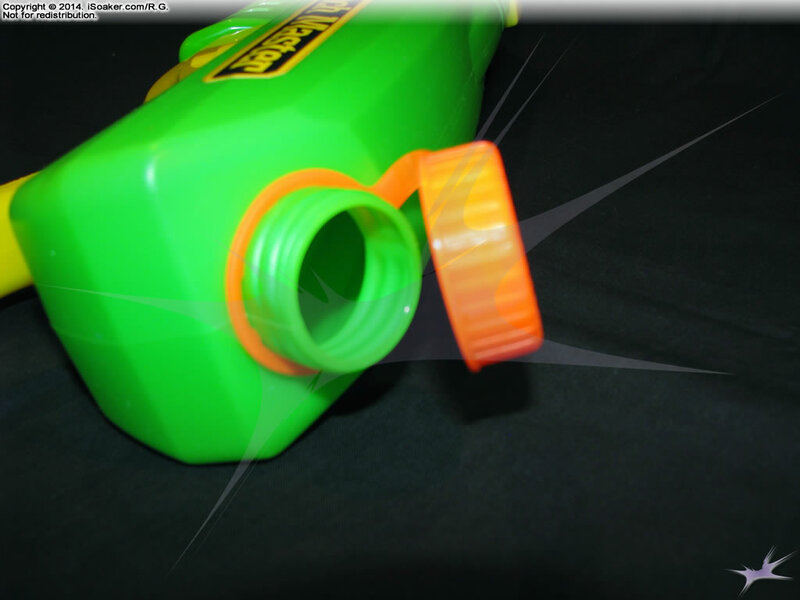 With two, useful nozzle settings to choose from and a good-sized reservoir, the Drench Master is a solid entry-level water blaster that offers good performance for its price. 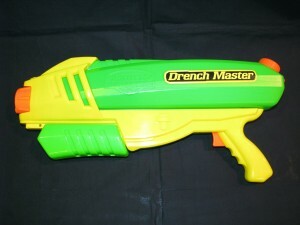 While not recommended for going full-on against a larger pressurized water blaster user, the Drench Master should still provide enough power to prevent any opponent from leaving a challenge unscathed. Next Next post: Water warriors Steady stream 2 available in Korea?